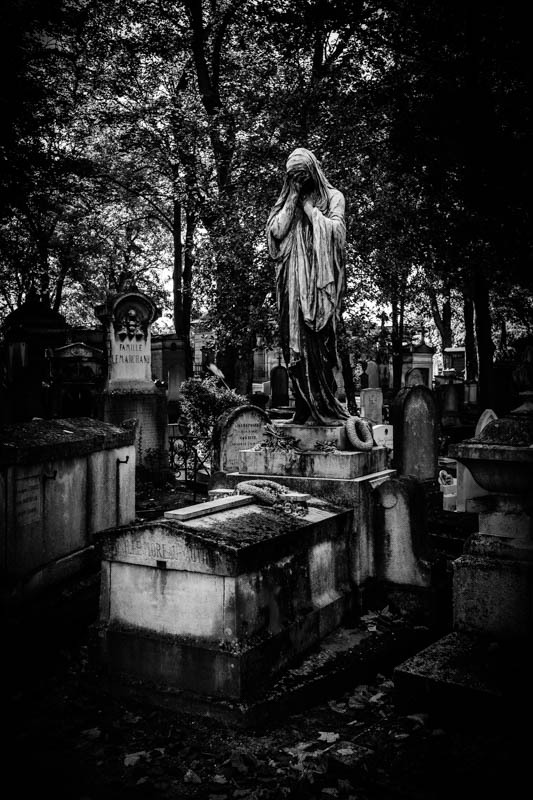 When you shoot cemeteries, as a photographer you’re conflicted: you want moody shots because of the subject matter and that suggests overcast light or rolling clouds. But generally as a photographer you tend to crave directional light, especially sunlight at dawn or dusk. 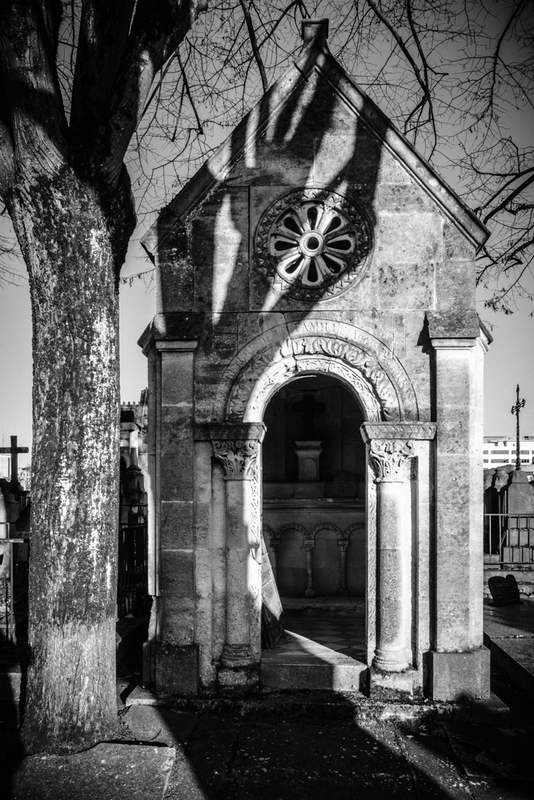 This shot is the latter, in Bordeaux’s ‘Cimetière de la Chartreuse’. 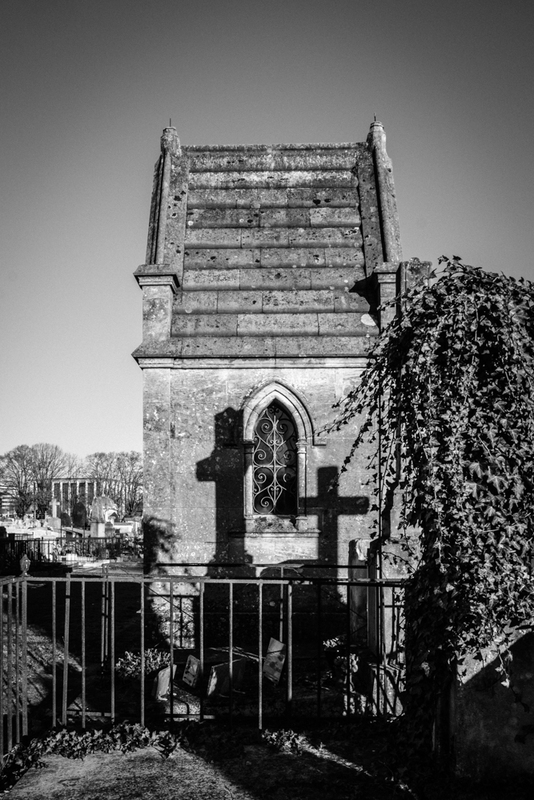 The shadow of the tree over the crypt seemed ominous and I decided to frame it as such. 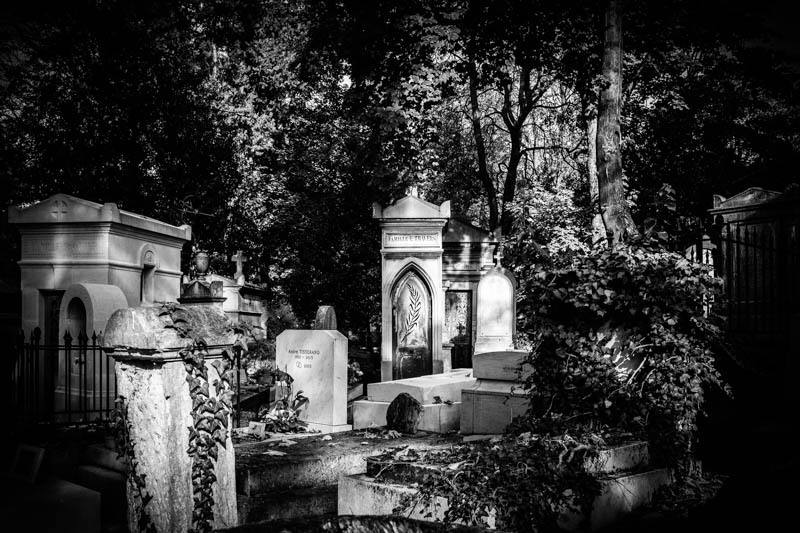 The comparison will probably sound strange, but at times, with those statues and tombs lost in the middle of the wilds, Highgate Cemetery reminded me of some of the more obscure ruins near Siem Reap, with stone overrun by vegetation. 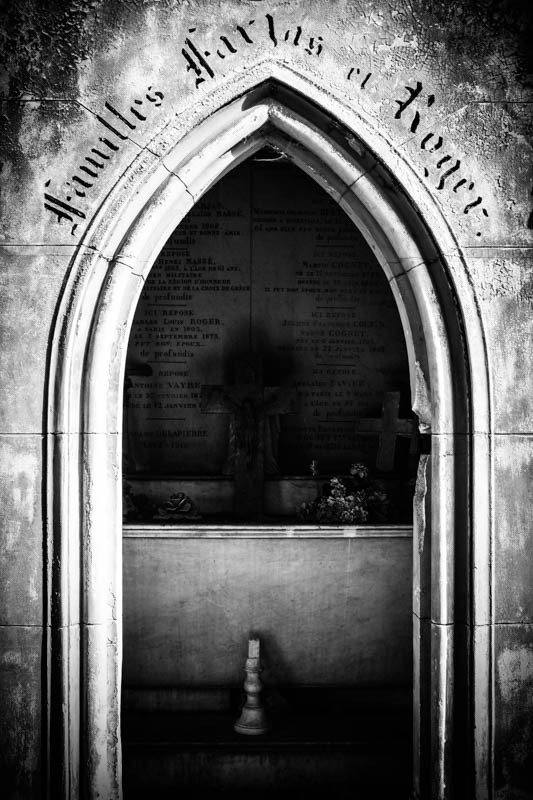 It’s not easy to capture the inside of a crypt, especially on a sunny day. You have to find one with the proper orientation to the sun so that the outside isn’t blown and the inside isn’t black. I quite like this shot for that reason. The statuary in cemeteries is rarely joyful, but often offers great opportunities for compositions. 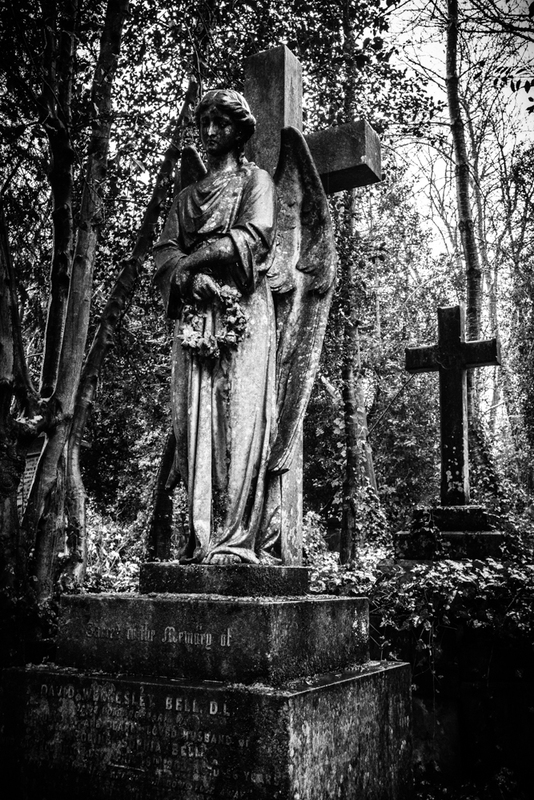 This is what I tried to do here, framing the statue of the weeping widow in context. What I really liked in the Père Lachaise cemetery compared to others I have visited is that parts of it are not nicely laid out and manucured. There are wild areas, where the tombs seem to jut from the ground, the vines have invaded the stones, etc. It feels much more like what I expect a cemetery to feel like, a place forgotten by the living. 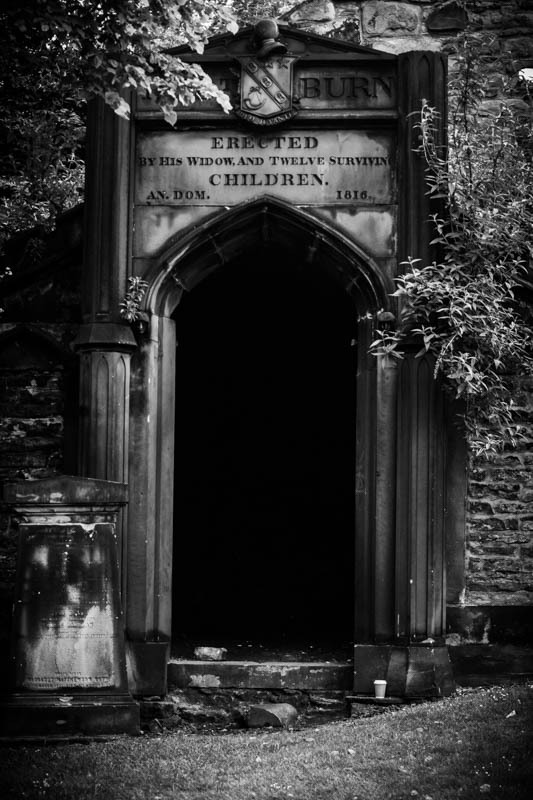 On the hills of Edinburgh sits the Old Calton Burial Ground, a wonderfully moody cemetery where I spent a good hour just wandering around and taking photos. Some of the mausoleums are massive, such as this one. 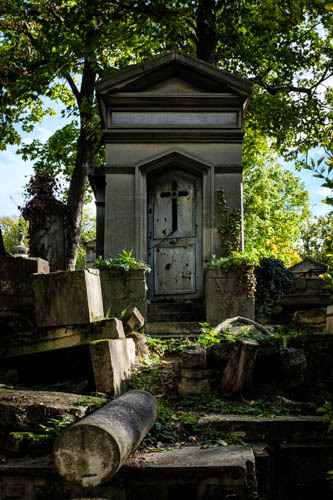 Believe it or not, despite having lived in or near Paris for close to two decades, I never went to the Père Lachaise cemetery, probably the most famous one in Paris. During my last trip there I took advantage of a sunny Saturday morning to correct that. Unlike the Montparnasse cemetery which I visited last year, the Père Lachaise is much wilder. There are very well curated areas, but it also has its share of ruined lots. My favourite.